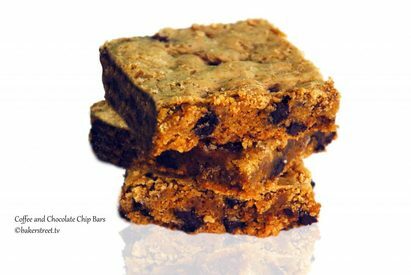 In honor of National Chocolate Chip Cookie Day, we present these delicious Coffee & Chocolate Chip Blondies! The bars are rich, dense and with an exceptional coffee flavor. The toasty coffee and sweet chocolate compliment each other perfectly making these bars a lovely morning nibble! Preheat the oven to 350F. Line a 9 by 13 inch baking pan with foil. Leave a two inch overhang on both sides; lightly mist the foil with cooking spray. Meanwhile, beat the eggs lightly in a small bowl with a whisk, just to mix the yolk and whites. In a small bowl, dissolve the instant espresso with vanilla. When the butter sugar mixture has cooled beat in the eggs with the whisk, then beat in the espresso vanilla mixture. Add the flour mixture and stir with a flexible spatula or a wooden spoon. Scrape down the bottom of the bowl ensuring all the dry ingredients are mixed in. Stir in chopped nuts and chocolate chips. Scrape down the batter into the baking pan and spread it evenly with a flexible spatula. Bake for 20 – 25 minutes until just golden brown and set in the centre. Transfer the pan to a wire rack and let to cool. Let it cool completely. For the nearest cut, place the pan in the refrigerator for 20 minutes before slicing. To slice use the overhang foil to remove the blondies and place on a large cutting board. Use a chef’s knife and cut into 24 pieces, wiping off knife between cuts, then carefully remove foil.